Armchair Fiction presents extra large editions of classic science fiction double novels. The first novel is called “The Alien Intelligence” by Jack Williamson. At the lip of a forgotten crater deep in the Mountain of the Moon, a silver ladder stretched downward through clouds of red and purple mist. Far below waited a crystal city, a beautiful woman, and alien horror…On Earth, having an above-average need for adventure, Dr. Winfield Fowler did not for one second question his duty in responding to his dear friend’s radioed pleas for help. Promptly, he gathered the items his friend had requested. He then provisioned three ponies for a grueling desert trek and set off into the barren sandy seas of Australia’s wasteland. But what would he find there? Master science fiction writer Jack Williamson gives us one man’s harrowing account of his journey to the depths of an alien territory—found right here on Earth! 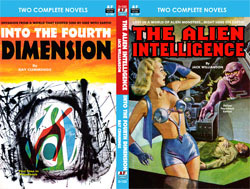 The second novel is a terrific tale, called “Into the Fourth Dimension” by Ray Cummings. Are there other worlds existing side by side with ours, yet unseen and unsuspected? Here is the incredible tale of three people who went through the ethereal wall that bars the way to this shadowy realm, a realm known as the Borderland. Beyond that they found a strange land and an even stranger race of intelligent beings, and in the ranks of those beings was a fantastic enemy, the likes of which Earth had never faced. Before long the greatest city in the world faced death and destruction from forces incomprehensible to the minds of men. And for all their military might, mankind seemed helpless to fight back. All they could do was stand and watch as their world was literally torn apart in front of them!